We’re so happy to have our gardens looking so good. Sure, the corn in the North garden is a bit spotty and a few melons had to be replanted as the vines got wind-blown during our big storm a week ago. But over all, we’re happy. Last night our apprentice, Alisha, came back and we were real glad to see her. She’s become family and we missed her! Today Alisha learned how to hill potatoes and why we hill them. (As the plants grow, you pull dirt up from both sides of the plant to bury ⅔ or so of the plant, leaving the top leaves sticking out of the soil. We try to hill the potatoes twice or even three times. Potatoes grow from the lower stems of the plants — not the roots — and the more stem of the plant that is buried, the more big potatoes you will end up harvesting.) If you’d like to learn more about growing potatoes, check out the Twenty Third Year Anthology for my article, Potatoes — the workhorse of the garden. 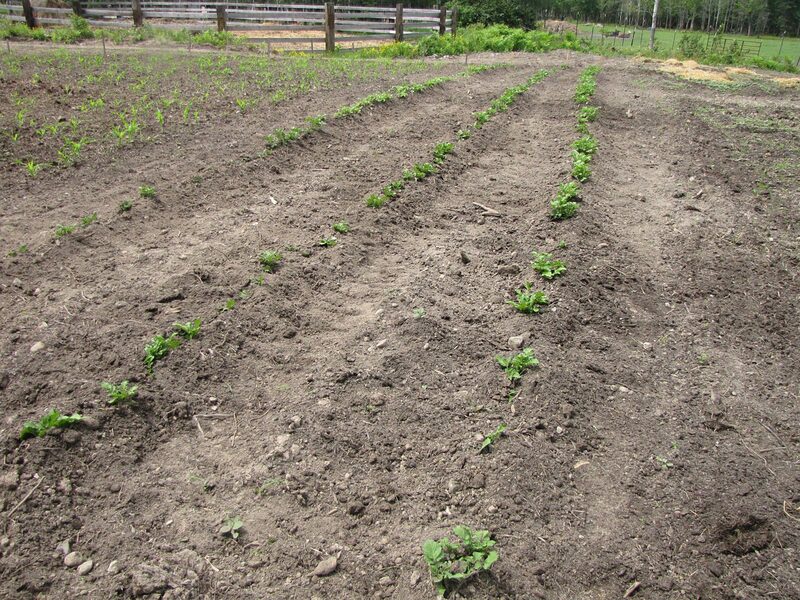 Our potatoes are now nicely hilled and growing like mad. While Alisha was busy hilling potatoes, I was working on mulching the pumpkins growing in our Sand garden. It was interesting; four days ago I mulched ⅓ of them and then got sidetracked. When I went back to mulch today, I noticed the plants which had been mulched were twice the size of the ones without mulch. Does that tell us something? Here’s a Santo Domingo pumpkin hill, mulched for 4 days. And another one I just mulched. See the difference? Our peonies are fabulous this year! I planted several different varieties and all are beautiful and smell great too. I keep a big bouquet on the dining room table. Who needs spray air freshener? 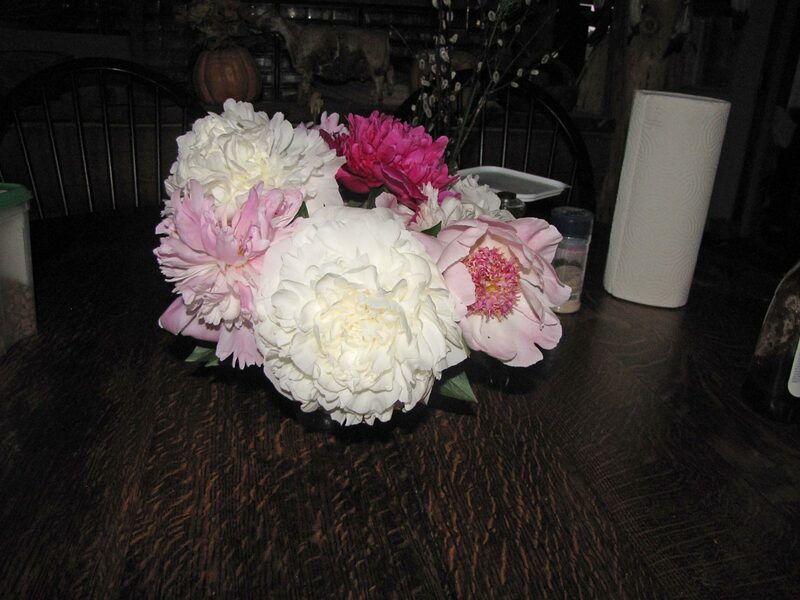 Check out some of the peonies from my flower beds. They smell wonderful. My oldest son, Bill, and his family came up on Sunday to help Will celebrate Father’s Day a bit late. (It’s good they didn’t come on Father’s Day as I was sick.) We all had a good meal of Sloppy Joes and a rousing game of Croquet in the front yard. Granddaughter, Ava, loves Ashley’s ducks and named one of the Crested ducks “Grandma.” Hmmm, maybe I should get a haircut? Looks great, I’m using leaf mulch that I saved from last fall. 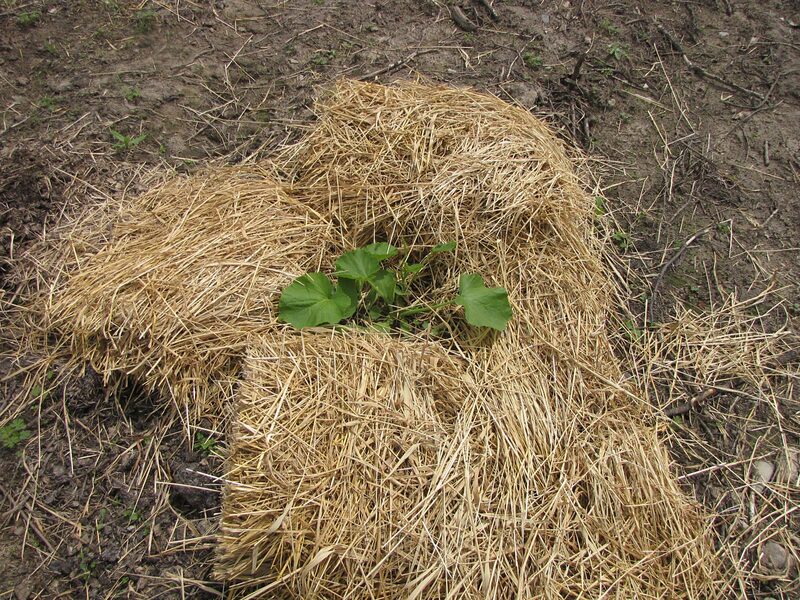 Mulching sure reduces weeding and adds much needed organic matter. I have planted 50 tomatoes in a totally new “virgin” area and see that I have yellowing of some of the lower leaves ? septoria. How does this happen in a totally new area? Overall with the rain my gardens are lush this year. You can get Septoria Leaf Spot in even virgin soil as it is passed around via spores, which can blow in the wind and are transmitted via rain and watering to lower leaves first. But if the leaves are just yellow it may not be Septoria. (Look for black spots on the yellowing leaves for an ID) Although Septoria is ugly it doesn’t usually affect the plants productivity. Thank God! Is that hay mulch you are using or straw?? 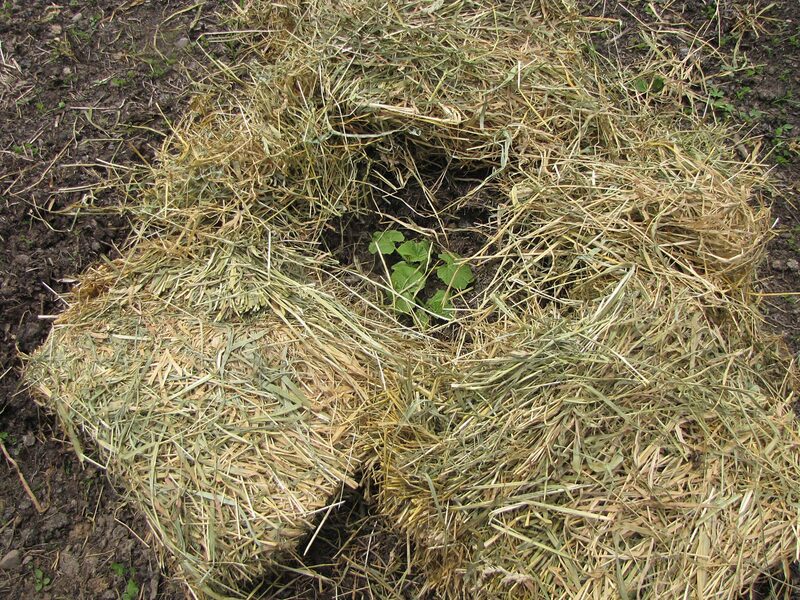 We use immature Reed Canary grass hay which we cut and bale ourselves. It is totally weed-free, lightweight and rots down over time so when we till in the fall, it’s mostly all gone and turned to black soil. With regular grass hay, you usually not only get grass seeds like timothy, but also quite a few weeds. That is a significant difference with the mulch! We mulch with all the materials we can get. Some years it’s more than others, but it’s a big help. We love potatoes, but the past several years, we’ve had fire ants eating them up. So far this year, we’ve tried spraying with our strongest organic remedies, pyganic and cedarcide, but neither seems to help much. Any suggestions? I use Amdro to kill the ants here in Wyoming. I disturb the hill a little bit, pour the cheese colored pellets into it and the ants grab them and take them into the hill. This kills ALL of the ants in the nest. I pour a small amount at a time so that none gets left on top of the hill and because I have a ten month old puppy that I don’t want to accidentally poison. With fire ants, you don’t want to disturb their mound. Just pouring the poison onto their hill close to the hole that they enter through will cause them to swarm it. You may have to treat the mound more than once to kill them all. Since you will be using this around your potatoes, I would pour very small amounts once a day until the ants are gone, that way you know that they have eaten it all and not just stored it underground. The best idea I could come up with is trying to get rid of the fire ant colonies closest to your garden. A lot of folks have had good luck pouring boiling water over the mounds several times where others have better luck drenching the hills with a pyrethrin solution. Thank you both! He has been using a pyrethrin spray, along with cedarcide, when it alone didn’t seem to be doing much. We haven’t really seen any mounds yet; just see them swarm out when we disturn the potato stems. It’s a challenge. I came to 2 of your past workshops and when there, at one of them, Will was doing cement work on the new barn. Well, these past 2 weeks my sister and I have been doing cement work only ours is with quick set cement mixed in a wheel barrel. Such a job but we all know homestead work is never done. But, once cemented it is done! my husband loves stewed rhubarb. However, when I canned it that way, he didn’t like it. Do you have any suggestions as to how to can rhubarb without stewing it? in chunks? thanks! Wow, your plants look great,Jackie! We have an community garden across the street where we have a raised bed I. Addition to our own, in fact, hubby just rode his bike over to see how ours are doing after our rain yesterday! Now we just have about 70% humidity,but going to be in 90’s later this week, guess we better enjoy the cool! I do okay with the heat but melt with the humidity. That’s when I find something to do inside! You’d be surprised at how cool a log home stays during the hot days. We’re lucky because it cools off at night…usually with a breeze so we can sleep. No AC! We live near you in Embarrass, MN and ordered seeds from you this year. We are so pleased with how they have been growing!!! Can you share your rhubarb canning recipe? This is the first year I have enough to put up. Thank you!